The San Francisco Bay and Delta were once ringed by a deep fringe of marshes. They acted as the lungs and kidneys of the ecosystem, filtering water and providing homes to millions of shorebirds, ducks, fish and other wildlife. But because of diking, dredging and filling before 1970 when modern environmental laws began to protect wetlands, the amount of tidal marsh around the bay and delta declined from roughly 555,000 acres in 1800 to about 40,000 acres by 2009 -– a drop of more than 90 percent. Since then, tidal marsh protection and restoration has been a priority for public agencies and environmental groups, and more than 11,000 acres have been added or restored. You can see an animation of the bay’s marsh history from the San Francisco Estuary Institute. Now a pilot project is underway near Hayward that could revolutionize future tidal marsh restoration efforts, and pave the way for protecting property that rings the bay from rising sea levels that most scientists expect as climate change continues to warm the planet. The “Horizontal Levee” project at the Oro Loma Sanitary District is a first-of-its-kind effort designed to mimic the way historical marsh areas work, from filtering wastewater to protecting the shoreline against battering waves and erosion during storms. Unlike traditional narrow levees or sea walls, “horizontal levees” are wider, with a gentle slope from dry land toward the bay that is similar to natural wetlands. They are designed to blunt the force of waves, preventing flooding. 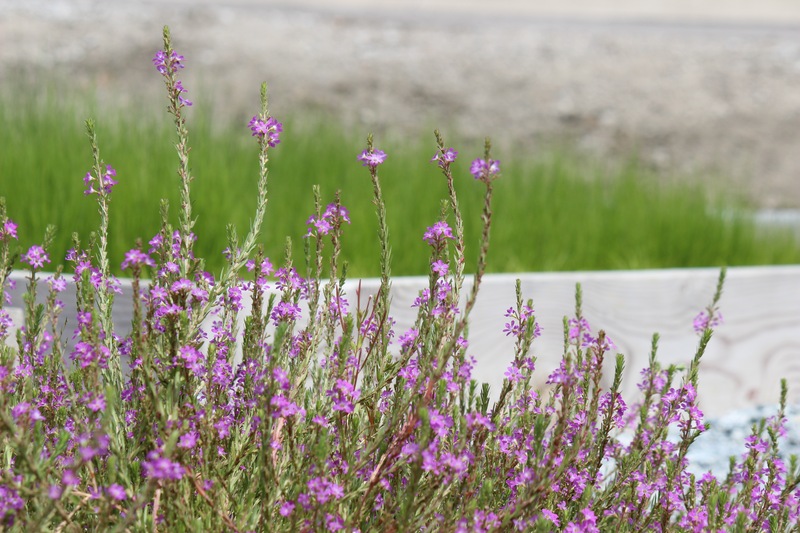 Planting thousands of native plants in the $9 million project is expected to begin Nov. 1, with the entire project taking about two years to complete. In addition to the wide, sloping levee, the plan also includes building a two-acre adjacent wetland area inside the levee near the Oro Loma sewage treatment plant. The new freshwater wetland area will hold up to 8 million gallons of overflow water in storms. The wide levee and the wetland will be covered with plants, and will naturally filter and clean treated wastewater from the sewage plant through thousands of rushes and sedges. It also will provide habitat for wildlife. If the project is successful, it could be duplicated around the bay, scientists say. You can see more of the design in this informational brochure from the sanitary district. Jessie Olson, nursery manager for Save the Bay, explained that planners grew more than 60,000 native marsh plants for the project. 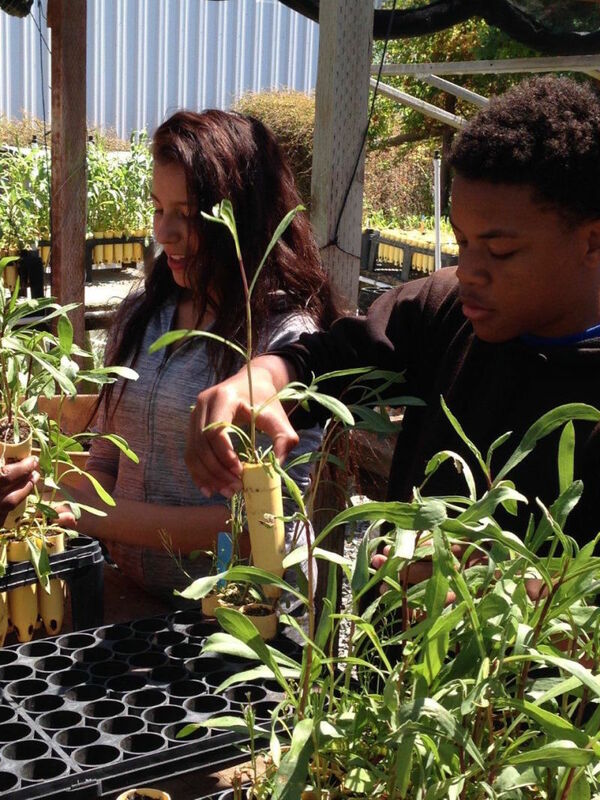 The plants were raised from seeds, hand collected last summer and early fall, or grown from cuttings taken from sites around the bay, including Sears Point, China Camp and East Bay Regional parks. 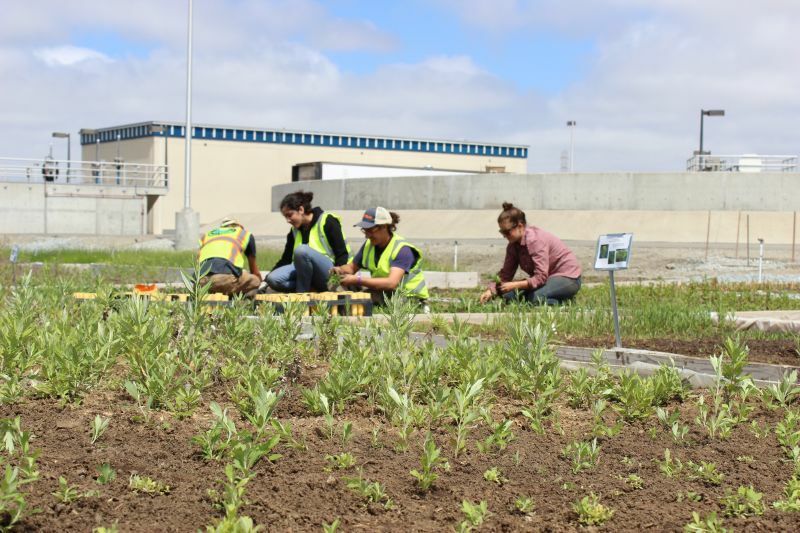 To grow the native plants, Save the Bay staff and volunteers installed 17 large raised beds near the restoration site in addition to two existing nursery areas in Oakland and Palo Alto. More than 20 species, including creeping wild rye, Baltic rush, spikerush, basket sedge and field sedge, western ragweed, California blackberry and alkali bulrush are ready to be planted in the project. The work is the latest in wetland restoration efforts around the east and southern parts of the bay, the most prominent being the South Bay Salt Restoration Project, in which state and federal officials are converting thousands of acres of former Cargill Salt industrial evaporation ponds back into marshes for ducks, shorebirds and fish.